There are some users on Pinterest whose Pins I am always repining. We just seem to have the same interests and taste in things I love. I’ve just found a way of viewing just their pins so I don’t miss any – instead of going to Pinterest I can view their pins via their Pinterest RSS feed. Everyone with a Pinterest account has a Pinterest RSS feed – http://pinterest.com/username/feed.rss. For example, my Techie Mum Pinterest account feed is pinterest.com/techiemum/feed.rss. Tip: Just add .rss to the address that appears on the address bar of your browser when you’re visiting the Pinterest board you want. 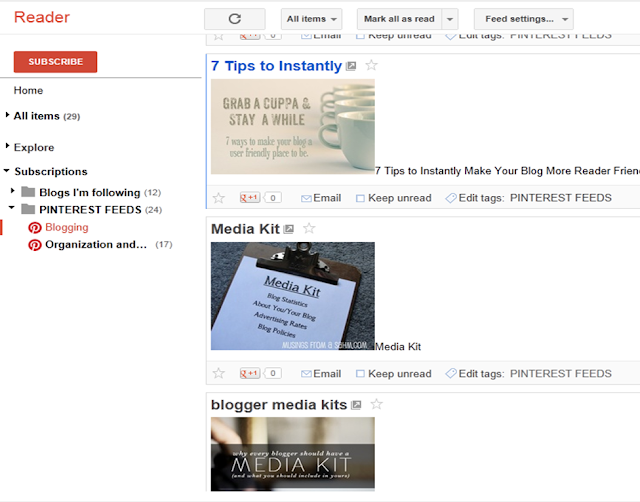 Once you know the RSS feed address you can add those feeds to whichever RSS reader you use. I mix mine between Google Reader and Outlook. For posts that are primarily text I use Outlook and have them delivered by email, and for blogs, and now Pinterest, I use Google Reader. Once you’ve subscribed to the RSS feed it will appear in your reader as it would a blog post. Here’s what it looks like in Google Reader. I keep my Blog subscriptions organised in a folder, and now I’ve created a folder for Pinterest subscriptions too. If you click on an image in your feed it will take you to that Pin in Pinterest – so you can then repin it. If you love spending hours on Pinterest you may not see any value in also having streams of Pinterest pins in your Reader as well. Besides making sure you don’t miss any pins by your favourites, there are some other instances when it may come in handy. Maybe you don’t want everyone knowing that you follow a particular user; or you want to keep track of what your competition is pinning. Is this something you’d use? I'm always wanting to know more about how best to utilise Pinterest. Thanks for this. Is there any way of integrating a blog from another site such as blogger or Weebly into pinterest? Yeah, I guess you have two-step verification where you can integrate your website and Pinterest.